What is an EMP Event? In 1952, the classic science fiction movie The Day the Earth Stood Still depicted a moment when all the cars stopped, lights went out, radios went silent and telephones no longer worked. The filmmakers didn’t spell it out in the movie, but the cause was an EMP attack. An electromagnetic pulse – an EMP event (pronounced as individual letters) – is a short burst of high-energy electromagnetism that under certain circumstances can disrupt or destroy electrical and electronic capability. Since much of modern life depends on electricity and electronics, a widespread EMP attack or EMP event could be a major catastrophe. The potential of an EMP attack isn’t science fiction. Some form of EMP event occurs with every bolt of lightning or wave of particles from solar storms striking Earth. It also happens in every nuclear explosion and the U.S. military deliberately tested for EMP effects with the 1962 “Starfish Prime” high-altitude explosion in the Pacific Ocean southwest of Hawaii. 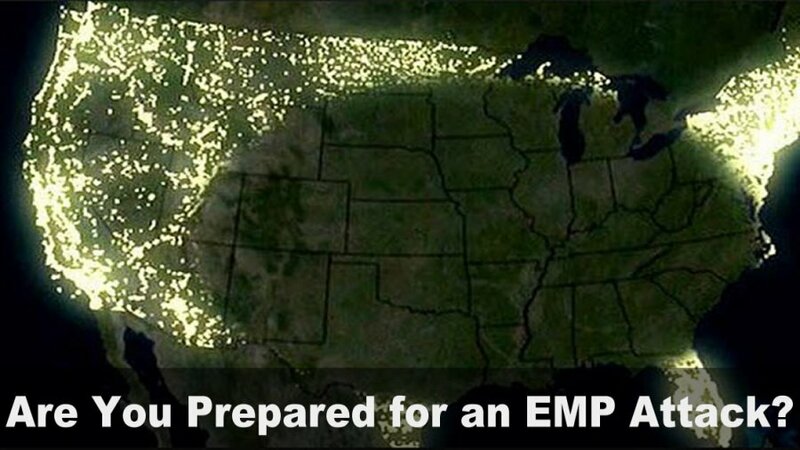 There’s quite a lot of misconception about preparing for an EMP attack, probably because it can be a highly technical subject and because there’s actually more than one kind of EMP event. Some EMP activity is trivial, for example, electrostatic discharge and the pulses of electrical motors. What most people think of as an EMP event is something with far more power and geographical impact, but even that comes in several types. Very briefly, it helps to understand that electromagnetic pulses, whether natural (solar flare, lightning), or man-made (nuclear bomb) are conventionally designated as E1 (a very fast electromagnetic pulse of gamma rays), E2 (an intermediate speed pulse of gamma rays), and E3 (a very slow but long lasting electromagnetic pulse). E1 carries an enormous amount of energy and is the most responsible for destroying electrical and electronic circuits. E2 is similar to the electromagnetic burst of lightning. E3 is caused by the impact of a large nuclear explosion or solar pulse on the Earth’s magnetic field creating a reaction that can be extremely destructive of electrical circuitry. As anyone knows who has watched a telephone explode or computer circuitry melt as the result of a nearby lightning strike, lightning produces a form of EMP (E2). The electromagnetic pulse of lightning is very powerful, as measured in mega-amperes. However, over the centuries we’ve become good at channeling and defeating lightning strikes, mainly by grounding the current flow. The constant solar energy we receive (sunlight) produces an insignificant amount of EMP when it strikes the Earth’s magnetosphere. However, when the sun kicks up a storm, in the form of major solar events such as unusually large or frequent solar flares and coronal mass ejections, there is always a chance the Earth will be in the path of the energy wave. This can cause a serious EMP event (mainly E3). There have been several recorded major solar EMP events, beginning with the 1859 observation by Richard Carrington of perhaps the largest solar storm on record. The world was only at the beginning of electrification and electronics did not exist, but this storm still damaged telegraph equipment. These days, a “Carrington Event” would strike a world filled with sensitive electronic equipment and a massive electrical grid. We’ve had some big solar storm events, but none yet with devastating power. Ever since the development of nuclear bombs, an EMP attack has been part of the radiation picture, however of secondary importance compared to the destructive nuclear blast itself and the lethal gamma and X-ray storm. Later, in the 1950s it was realized that the EMP produced by a nuclear detonation might be a different form of weapon – one that could destroy a country’s economic activity without destroying a lot of property or people. This led to the HEMP (High-altitude EMP) bomb, a nuclear device exploded high in the atmosphere (from 100-400 kilometers above the Earth), which could produce all three types of EMP attack pulses (E1, E2, and E3). A nuclear explosion is not required to produce weaponized EMP. Various technologies (low-inductance capacitor bank, microwave generator, pumped flux compression generator) can also produce EMP events at levels that disrupt electronics and electrical circuits. Research into Non-nuclear EMP attack (NNEMP) is decades old, producing a variety of weapons with localized effect that could be used for limited targets such as knocking out the communications of a naval vessel or destroying a computer facility. So far, most of the devices are impractical (meaning they cost too much). What is the Greatest EMP Threat? The short answer to the question “What is the greatest EMP threat?” is either a super-solar event or a rogue nation with HEMP attack capability. It’s generally thought that a massive solar storm, caused by a highly active period of solar flares or coronal mass ejection (CME), similar to what was experienced in 1894, could produce an EMP event (especially with E3 energy) very damaging to the Earth’s electrical/electronic infrastructure. The problem is that current scientific knowledge about the sun and solar weather isn’t good enough to make precise predictions. About all that can be said is such a major solar storm is most likely during the high-energy time of the (roughly) 11-year solar cycle. We are 4 years into the current cycle. Governments (e.g. the military) all over the world have been dealing with EMP threat assessment for at least fifty years. It’s a tough assignment because the important technical information is subject to change (especially for NNEMP), and the motivational aspects (politics, economics) are difficult to evaluate and predict. It’s thought very unlikely that an EMP attack will originate with a terrorist organization because they lack the technical capability to build an appropriate nuclear device and deliver it to the necessary altitude and geographic location. Eventually terrorists may have access to non-nuclear EMP devices but are likely not to choose them because they don’t kill many people nor destroy buildings. It’s more likely that a rogue state (e.g. North Korea, Iran) with the basic technological capability (nuclear weapons, missiles) could deliver an EMP attack, although at their current state of development, it is unlikely. The key to this assessment is the need to produce a HEMP bomb with around 100 kiloton capacity (enough to do serious damage to a wide geographical area), and deliver it accurately to a high altitude location (requiring long-range missiles that could penetrate defensive shields). Almost all other states in the “nuclear club” are capable of building and delivering a HEMP attack. As an option, an EMP attack is an economic weapon, and more likely to be used as a threat than an actual mode of attack. Whether from a solar storm or an attack by a rogue state, most of the clamor for preparation against an EMP event is at the level of national government. The call to ‘harden’ military, government and civilian facilities against EMP effects is many decades old. For the most part, only the military has expended much effort. In the United States various researchers (Air Force, Navy) and Congressional activity (notably the 2004 EMP Commission) have generally concluded that an EMP attack is possible and worth an investment to protect key facilities and stockpile essential parts and equipment to replace damaged components. As with many types of threats (from bioweapons to climate change), a complete preparation would be enormously (many would say prohibitively) expensive. The typical response is therefore to be very selective in preparation or to quietly ignore the issue. From a survivalist’s point of view, preparing for an EMP attack is a little complicated. Most importantly, EMP is not initially a threat to survival. If there are casualties from an attack, they will mostly be unfortunate accidents. The real threat comes after an EMP when food, water, and fuel supplies are depleted due to electrical failure of water plants and the inability to produce and ship food across the country. Disruption or shut down of communications is likely, which could cause major panic among the populace. Social unrest and looting of stores is another possibility, as the majority of people will have no emergency supplies set aside and will seek to take from those that do. There is a wealth of information on the internet about protecting small electronics through the use of a “Faraday Cage” and other devices, but it must be researched and executed correctly. Hardening your electronics is possible, but difficult to do well and besides, most connecting systems will be down anyway. A more effective strategy is the general survivalist “off the grid” approach, coupled with alternative sources of energy (solar, wind, biofuel generator) that are unlikely to be affected by an EMP attack. As with many kinds of major catastrophes, an EMP attack could produce widespread chaos and a breakdown in normal economic and social order – meaning, of course, that there may be riots, food shortages, loss of medical services etc. Again, the usual survivalist approaches – ability to evacuate, a safe harbor location, emergency supplies – are the best preparation.